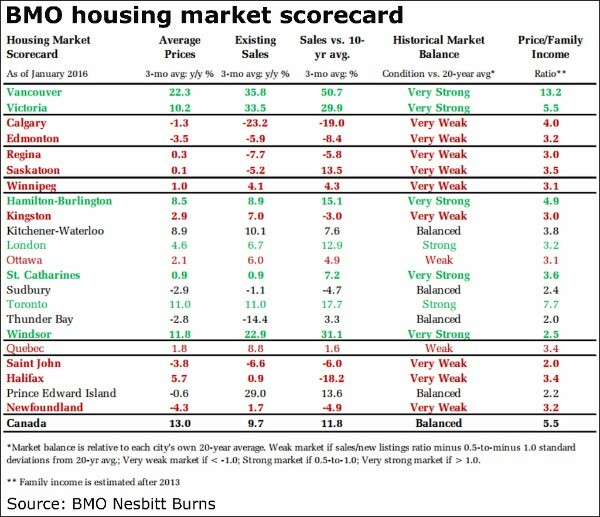 Data released earlier this week for January showed the stunning disparity in regional housing markets in Canada (see chart below). Vancouver remains the red-hot leader with year-over-year (y/y) price gains of 20.6% and home resales growth of an eye-popping 32.1%. In comparison, Toronto’s housing market seems almost tepid, with an annual price gain of 10.7% and resales growth of a mere 7.3%. In direct contrast, regions of the country that have been hard hit by oil price declines continue to experience a marked slowdown in housing activity. For example, house prices in Calgary fell 3.1% y/y in January and existing home sales fell 13.8%. In recent months, the decline has been even bigger. Sales in Calgary are down more than 40% from their 2014 high. In this context, the price declines have been relatively modest. Additional price cuts are likely through 2016. Those who purchased homes before mid-2013, however, still have significant but dwindling equity gains. The BC budget, released this week, shone the spotlight on the lack of affordable housing in the Vancouver region. Vancouver has an almost unheard of 91% sales-to-new listings ratio implying that almost every new listing is sold within the month. Concern about housing affordability prompted the BC government to introduce measures to address escalating housing market imbalances. British Columbia has the strongest economy in the country, with growth expected to be roughly 2.4% this year. BC also has the strongest fiscal position, with a triple-A debt rating and surpluses expected to continue. The BC economy, though hit by falling commodity prices, is sufficiently diversified to have weathered the storm quite well–boosted by strength in manufacturing, retailing, technology, trade and film. Population growth and a tourism boom is also contributing to the prosperity. More than 48,200 newcomers are expected to move to BC this year, including 13,000 from other provinces and 35,200 from other countries. Alberta’s woes have caused thousands of workers to move westward. In the third quarter of 2015, BC posted the highest quarterly level of net interprovincial migration since 1995. The weak Canadian dollar has boosted tourism and the film industry in Hollywood North. In the first overhaul of the Property Transfer Tax since its inception in 1988, Finance Minister Mike de Jong raised the exemption threshold solely on new homes to $750,000 if they are owner occupied as a principal residence for at least one year. This new tax break is available only to Canadian citizens or permanent residents and could mean a savings of up to $13,000. This could bump up the price of new homes unless it triggers an increase in supply, as the government hopes. To offset the anticipated $75 million cost of this initiative, the government is increasing the Property Transfer Tax rate on the portion of the home value that is in excess of $2 million to 3% (the current 1% on the first $200,000 and 2% on the value between $200,000 and $2 million will be maintained). Budget 2016 confirmed an earlier announcement that the province is committing $355 million over a five-year period to construct or renovate affordable housing units throughout the province. The government also proposes new measures to improve data collection around real estate transactions, specifically to monitor foreign investment. Homebuyers will have to identify as Canadian citizens or permanent residents when they register their property and individuals who are neither will be required to disclose their country of citizenship; corporations will be required to disclose their directors’ citizenship; homebuyers will have to disclose whether they are buying the property as a trustee. Greater transparency into the currently opaque foreign investment component of housing activity is overdue and should help to provide a factual basis for future discussion. Hopefully, the province will continue to welcome foreign investors as the Minister suggests. The effect of these measures will be modest at first. It will take time to assess their impact, but the majority of purchasers are buying existing homes, not new homes, so the relief will not be widespread.